When we talk US military standards, we talk hard numbers, not opinions. The M9 has been put through impossibly-rigorous durability and reliability tests that greatly exceed any kind of real-life situation–and it has passed them all with flying colors. For instance, it will keep functioning in temperatures as low as -40 F and as high as +140 F, and it consistently fires over 35,000 rounds of commercial ammunition before a failure. It will keep functioning reliably even after being buried in the sand or snow, or being repeatedly dropped on hard surfaces like asphalt or concrete. 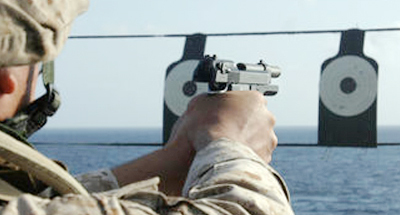 Beretta’s engineering experience and the quality of the steels used enable this kind of reliability, on which America’s servicemen and women depend every day. 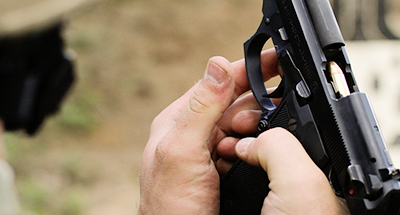 Another official test that the M9 had to pass was at the firing range. Even here, the demands of the US military far exceed most conditions in which a handgun is used–and even here, the M9 delivers. As per government testing guidelines, this pistol is capable of firing 10-shot groups of 3 inches or less at a distance of 50 meters (approximately 55 yards), with consistency and reliability. 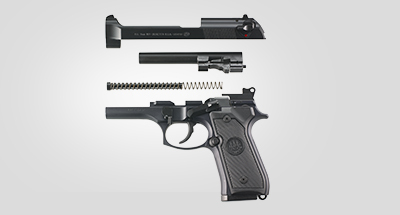 With other brands and models of premium pistols, this kind of accuracy may only be attained with extensive (and expensive) modifications and customization with after-market parts, while the M9 offers it right out of the box. Also check out the M9A1, a version of the classic M9 modified to meet the specific requirements of the US Marine Corps.